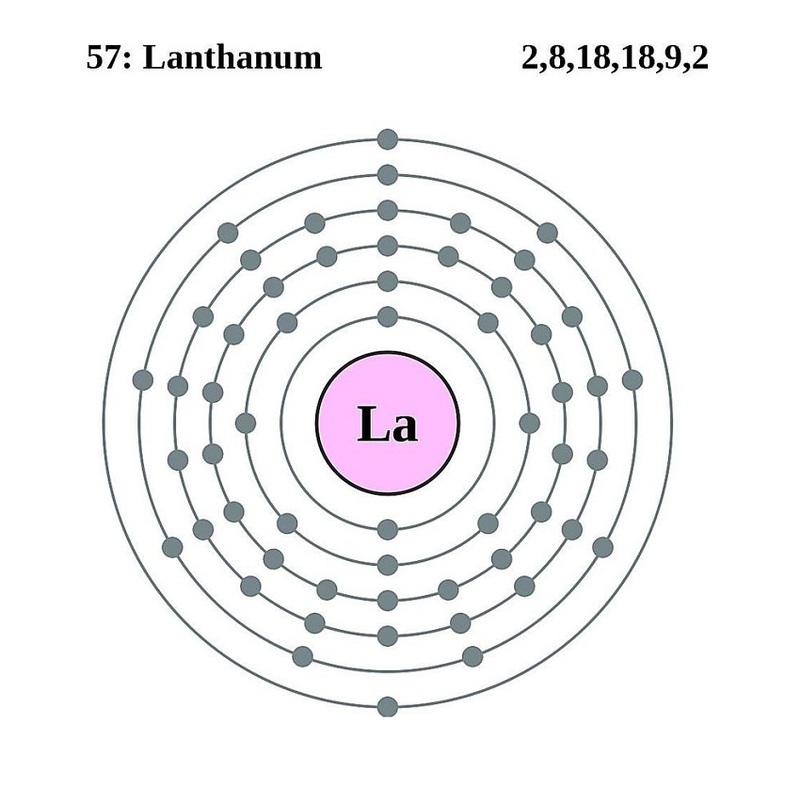 Lanthanum (pronunciation: LAN-the-nem)  is a soft, silvery rare-earth metal belonging to the lanthanoids family and represented by the chemical symbol La [1, 2]. Its main isotopes include the most abundant 139La (with 99.91% natural abundance) and the most stable 138La, the radioactive isotope with a half-life period of 1.06 X 1026 years [1, 4]. The element naturally occurs in bastnaesite and monazite, making up 38% and 25% of the rare-earth minerals respectively . Isolation of lanthanum from these minerals involves solvent extraction and ion-exchange separation techniques . The metal can be produced through calcium reduction of anhydrous fluoride . The top 3 lanthanum producing countries include China, Russia, and Malaysia while the top 3 countries with the largest lanthanum reserves are China, CIS Countries, and the USA . 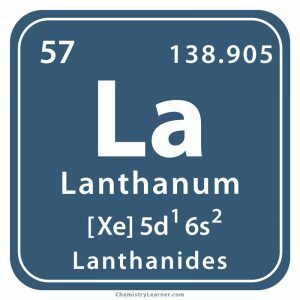 Origin of its Name: The name of the element is derived from the Greek word ‘lanthanein’, which means to lie hidden, as its existence in cerium oxide was long undetected . 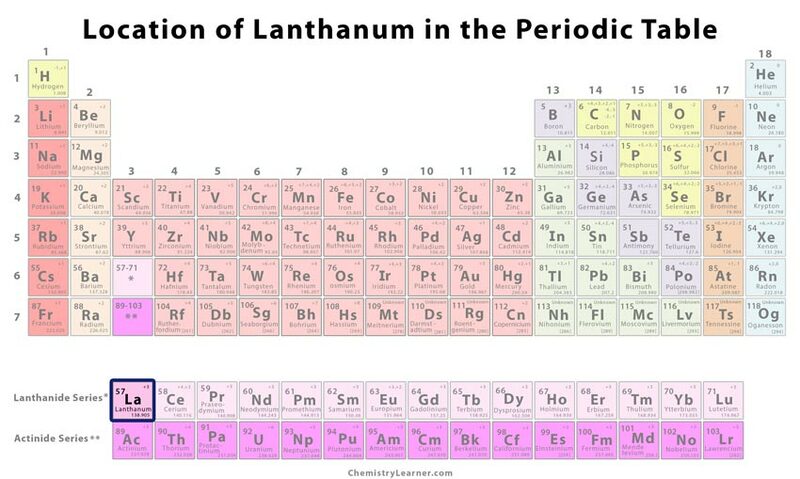 Who discovered it: The Swedish chemist Carl Gustaf Mosander is credited with the discovery of lanthanum . In January 1839, lanthanum was extracted by Carl Mosander while working on his sample of cerium at the Karolinska Institute in Sweden . He took powdered cerium nitrate and treated it with dilute nitric acid . He observed that some of the nitrate powder dissolved in the acid, and then he decided to isolate the mixture from the precipitate by using heat and sodium oxalate . The pale brick-colored oxide obtained was given the name lanthana [3, 5]. A student at the Karolinska Institute, Axel Erdmann discovered the element independently from a new mineral found in a Norwegian fjord [1, 5]. 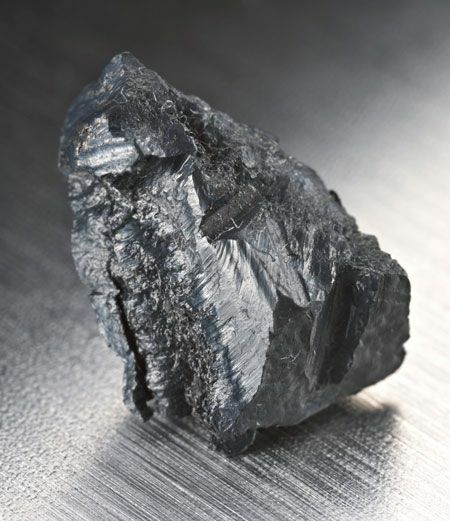 The new mineral was named mosandrite after Carl Mosander who produced impure lanthanum from anhydrous cerium chloride . In 1923, pure lanthanum was obtained by Kremers and Stevens through electrolysis of fused halides . An alloy of lanthanum and nickel is used for hydrogen storage in hydrogen-fueled vehicles . It is used in large amounts in the anode (positively charged electrode) of NiMH (nickel metal hydride) batteries that are found in hybrid cars [1, 5]. 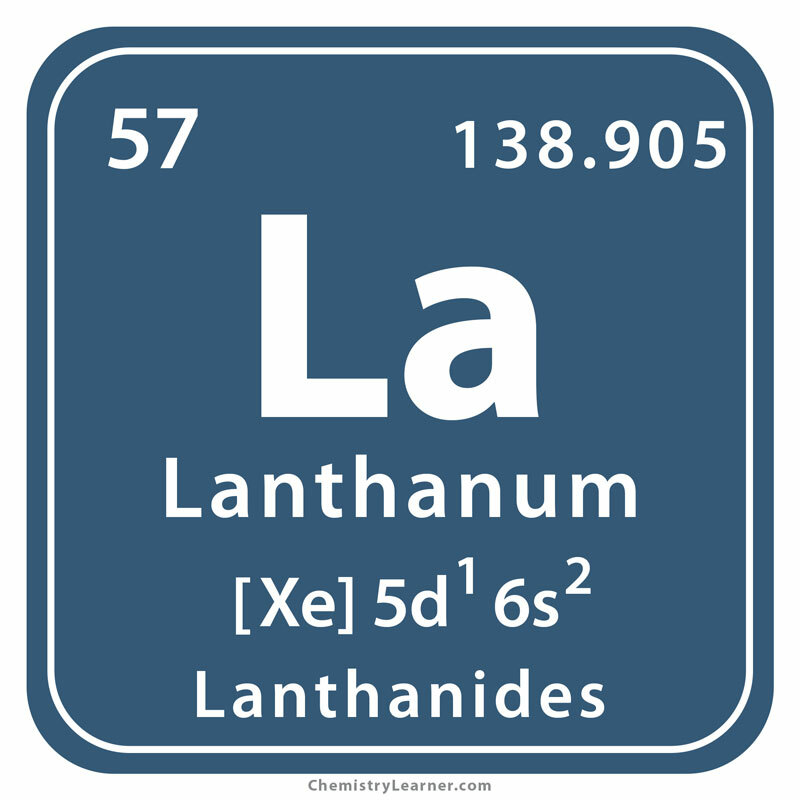 Lanthanum is a constituent element in misch metal (an alloy of rare earth metals) that is used in flints for producing igniting sparks in cigarette lighters . Compounds with lanthanum are extensively used in cinema projection, studio lighting, and other carbon lighting applications . Lanthanum (III) oxide (La2O3) is used in producing high-quality optical glasses, telescope and camera lenses because it has low dispersion, high refractive index, and it imparts high alkali resistance [1, 5], producing a clear, sharp image. It is used as a catalyst in petroleum industries for cracking the long chain hydrocarbons . Ionic lanthanum (La3+) is used as a tracer and marker of Ca2+ spikes in blood, and studies have shown that radioactive lanthanum and its compounds may be used in treating cancer . Lanthanum carbonate (fosrenol) is useful for reducing phosphate levels in people affected by kidney disease . 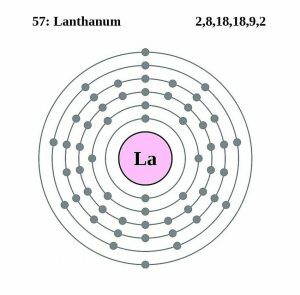 Lanthanum and its compounds, although not known to play any biological role in humans, can be a little or moderately toxic and should be handled with caution and proper protection . The element rapidly oxidizes in air and is easily burned when ignited . It is sometimes visually represented with an image of a camera lens in reference to its use in cameras . The price of 100 grams of pure lanthanum is around $800 while its price in bulk ranges between $6,000 and $6,500 [5, 8].